Using common sense to halt our perilous drift, Pope Francis snaps us back to our senses with a stunning reality check. His pointed comments in the encyclical Laudato Si': On Care for Our Common Home, pierce the bubbles of contemporary “wisdom” to restore our true values to their rightful place. By simply holding a mirror to the facts – facts we can all recognize – the Pope tackles taboo subjects head-on, exposing them as myths, and dangerous ones at that. In recent years we have been led to believe that bottom is up and wrong is right, and that questioning the new order borders on treason. But Francis resets the course, invoking a higher allegiance to the true source of life as intended by our Creator, reflected in millennial values commonly held by humanity and all religions. 54…. There are too many special interests, and economic interests easily end up trumping the common good and manipulating information so that their own plans will not be affected. 195. The principle of the maximization of profits, frequently isolated from other considerations, reflects a misunderstanding of the very concept of the economy. 56. In the meantime, economic powers continue to justify the current global system where priority tends to be given to speculation and the pursuit of financial gain, which fail to take the context into account, let alone the effects on human dignity and the natural environment…. As a result, “whatever is fragile, like the environment, is defenseless before the interests of a deified market, which become the only rule” (quoting Evangelii Gaudium, 2013). Who among us could not relate to this characterization of the cause of suffering, turning the conventional justification on its head? 129…. To claim economic freedom while real conditions bar many people from actual access to it, and while possibilities for employment continue to shrink, is to practice doublespeak. 189. Politics must not be subject to the economy, nor should the economy be subject to the dictates of an efficiency-driven paradigm of technocracy. Today, in view of the common good, there is urgent need for politics and economics to enter into a frank dialogue in the service of life, especially human life. Saving banks at any cost, making the public pay the price, foregoing a firm commitment to reviewing and reforming the entire system, only reaffirms the absolute power of a financial system, a power which has no future and will only give rise to new crises after a slow, costly and only apparent recovery. The financial crisis of 2007-08 provided an opportunity to develop a new economy, more attentive to ethical principles, and new ways of regulating speculative financial practices and virtual wealth. But the response to the crisis did not include rethinking the outdated criteria which continue to rule the world. 190.…Once more, we need to reject a magical conception of the market, which would suggest that problems can be solved simply by an increase in the profits of companies or individuals. Is it realistic to hope that those who are obsessed with maximizing profits will stop to reflect on the environmental damage which they will leave behind for future generations? Where profits alone count, there can be no thinking about the rhythms of nature, its phases of decay and regeneration, or the complexity of ecosystems which may be gravely upset by human intervention. 82....When nature is viewed solely as a source of profit and gain, this has serious consequences for society. This vision of “might is right” has engendered immense inequality, injustice and acts of violence against the majority of humanity, since resources end up in the hands of the first comer or the most powerful: the winner takes all. 203…. Since the market tends to promote extreme consumerism in an effort to sell its products, people can easily get caught up in a whirlwind of needless buying and spending. Compulsive consumerism is one example of how the techno-economic paradigm affects individuals…This paradigm leads people to believe that they are free as long as they have the supposed freedom toconsume. But those really free are the minority who wield economic and financial power. 204.... Obsession with a consumerist lifestyle, above all when few people are capable of maintaining it, can only lead to violence and mutual destruction. 106…. the idea of infinite or unlimited growth, which proves so attractive to economists, financiers and experts in technology. It is based on the lie that there is an infinite supply of the earth’s goods, and this leads to the planet being squeezed dry beyond every limit. We have a ready resource for curing our ills. 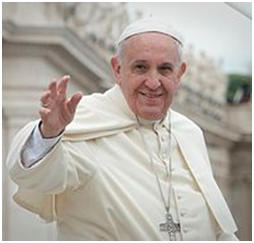 The Papal Encyclical bears many more passages that can serve to guide the urgent task ahead. Time spent exploring it promises a fruitful and uplifting experience. Time, my brothers and sisters, seems to be running out; we are not yet tearing one another apart, but we are tearing apart our common home. Today, the scientific community realizes what the poor have long told us: harm, perhaps irreversible harm, is being done to the ecosystem. The earth, entire peoples and individual persons are being brutally punished. And behind all this pain, death and destruction there is the stench of what Basil of Caesarea called “the dung of the devil.” An unfettered pursuit of money rules. The service of the common good is left behind. Once capital becomes an idol and guides people’s decisions, once greed for money presides over the entire socioeconomic system, it ruins society, it condemns and enslaves men and women, it destroys human fraternity, it sets people against one another and, as we clearly see, it even puts at risk our common home. This article was originally published by Fellowship of Reconciliation on July 27, 2015.